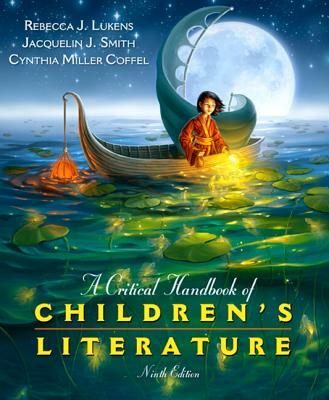 A Critical Handbook of Children's Literature, Ninth Edition, gives future teachers, practicing teachers, librarians, and parents many examples of quality children's literature to guide them in choosing the best books for the classroom, library, or home. The Handbook analyzes children's books that showcase positive examples of the literary elements, formats, and genres that are the focus in the field of children's literature. The books are noteworthy children's books, from classics to favorites to just-published titles, all selected as thought-provoking, important, or motivating choices. The authors suggest that readers examine the Handbook and then apply the literary concepts to additional reading from today's ever-expanding selection of children's books. Rebecca J. Lukens graduated with honors from Concordia College in Minnesota, earned an M.A. from Syracuse University, and next worked on the editorial staff of a children's encyclopedia in New York. After a year on the faculty of St. Olaf College followed by her marriage, she taught at New York State College, Albany, and later at Ohio University, Chillicothe. After publication of a few children's stories, Miami University Department of English hired Lukens to teach Children's Literature-not "Kiddy Lit"-as well as technical and expository writing. The first edition of A Critical Handbook of Children's Literature was published by Scott Foresman in 1976, and A Critical Handbook of Literature for Young Adults by Harper Collins in 1994. Lukens also co-edited a literature anthology, Woman: An Affirmation, published by D. C. Heath in 1979. Her latest publication, It's Been Great, is a memoir dedicated "to my children and theirs." Lukens's retirement teaching has been with Miami University's Institute for Learning in Retirement; her favorite class she called "Laughter for Health and Sanity." Jacquelin J. Smith is a career educator whose experience spans grades 2--8 through pre-service teaching. Children's Literature has been a passion throughout her career, from literacy learning to connections across the curriculum. She has shared many cross-curricular teaching and learning strategies for science, social studies and math with children's books at numerous professional conferences and in publications with the National Council of Teachers of Mathematics. A lifelong learner and Children's Literature instructor at the University of Northern Iowa, her studies continually confirm both her appreciation for and belief in the power of critically examining children's literature. Cynthia Miller Coffel is the author of Thinking Themselves Free: Research on the Literacy of Teen Mothers. Her research in children's and young adult literature has appeared in journals such as The ALAN Review, Reader, and QSE. Her work won the Jeffrey E. Smith award for nonfiction from The Missouri Review in 2007, and her literary essays have twice been listed among the notable essays of the year in The Best American Essays series. Her PhD in literacy education is from the University of Iowa.